Milton Mueller, a professor at Syracuse University’s School of Information Studies, is a familiar figure to anyone who follows Internet governance issues. He has established himself as a leading Net governance guru thanks to his extensive academic record in this field with books like Ruling the Root: Internet Governance and the Taming of Cyberspace (2002) and his work with The Internet Governance Project and the Global Internet Governance Academic Network. 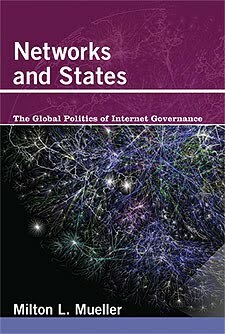 Mueller’s latest book, Networks and States: The Global Politics of Internet Governance, continues his exploration of the forces shaping Internet policy across the globe. What Mueller is doing – better than anyone else, in my opinion – is becoming the early chronicler of the unfolding Internet governance scene. He meticulously reports on, and then deconstructs, ongoing governance developments along the cyber-frontier. He is, in effect, a sort of de Tocqueville for cyberspace; an outsider looking in and asking questions about what makes this new world tick. Fifty years from now, when historians look back on the opening era of Internet governance squabbles, Milton Mueller’s work will be among the first things they consult. Mueller’s goal in Networks and States is two-fold and has both an empirical and normative element. First, he aims to extend his exploration of the actors and forces affecting Internet governance debates and then develop a framework and taxonomy to better map and understand these forces and actors. He does a wonderful job on that front, even though many Net governance issues (especially those related to domain name system issues and ICANN) can be incredibly boring. Mueller finds a way to make them far more interesting, especially by helping to familiarize the reader with the personalities and organizations that increasingly dominate these debates and the issues and principles that drive their actions or activism. Mueller’s second goal in Networks and States is to breathe new life into the old cyber-libertarian philosophy that was more prevalent during the Net’s founding era but has lost favor today. I plan to discuss this second goal in more detail here because Mueller has done something quite important in Networks and States: He has issued a call to arms to those who care about classical liberalism telling us, in effect, to get off our duffs and get serious about the fight for Internet freedom. Mueller says his “normative stance is rooted in the Internet’s early promise of unfettered and borderless global communication, and its largely accidental and temporary escape from traditional institutional mechanisms of control.” (p. 5) Faithful readers of this blog won’t be surprised to hear that I love the sound of that, but let me spend a second on the semantics of “cyber-libertarianism,” since it’s a subject near and dear to my heart. As Berin Szoka and I noted in our essay, “Cyber-Libertarianism: The Case for Real Internet Freedom,” many scholars and pundits mistakenly conflate cyber-libertarianism and Internet exceptionalism. They are not identical. Rather, as Berin and I argued, they are close cousins. Properly defined, cyber-libertarianism is essentially the application of traditional libertarian thinking — which is more properly defined as classically “liberal” — to Internet policy issues. Berin and I define “cyber-libertarianism” as “the belief that individuals — acting in whatever capacity they choose (as citizens, consumers, companies, or collectives) — should be at liberty to pursue their own tastes and interests online.” Internet exceptionalism, by contrast, is the belief that the Internet has changed culture and history profoundly and is deserving of special care before governments intervene. But that does not necessarily tell us what sort of philosophy or core tenants ultimately animate exceptionalism going forward. Quite right. After walking through the various issues and case studies presented in the book, Mueller makes a convincing case for giving cyber-libertarianism another chance; a chance that it really never had. “At its core,” Mueller continues, “denationalized liberalism favors a universal right to receive and impart information regardless of frontiers, and sees freedom to communicate and exchange information as fundamental and primary elements of human choice and political and social activity.” (p. 269) Moreover, “this ideology holds a presumption in favor of networked, associative relations over hierarchical relations as a mode of transnational governance,” he argues. “Governance should emerge primarily as a byproduct of many unilateral and bilateral decisions by its members to exchange or negotiate with other members (or refuse to do so).” (p. 269) Finally, he says, “a denationalized liberalism strives to make Internet users and suppliers an autonomous, global polity.” (p. 270) In essence, it’s about free will, freedom of action, and freedom of association. Again, it’s essentially classical liberalism for the Information Age. Just as it is legitimate and necessary to insist on citizens’ procedural rights with respect to the exercise of content regulation by their states, so it is legitimate, necessary – and far more important – to insist on eliminating as much censorship as possible in line with substantive free expression rights. We must uphold the concept of freedom of expression, and insist on the right of individuals to access information and communication others regardless of what state they reside in. We must, in other words, question the scope of national sovereignty over communications. If citizens a right to be informed that their government is blocking access to external information, then perhaps it is not too crazy to ask whether they also have a right to get that information without interference by their national government. If people have rights and expectations regarding the procedural mechanisms by which censorship is exercised, then perhaps they should also have rights and expectations about the minimizing the scope of censorship. Some will dismiss Mueller’s approach based simply on its far-reaching implications. He’s making a powerful, beautiful case for the preeminence of individual speech/communication rights over the State, but in doing so in the context of Internet governance, he’s essentially saying that there can’t be much Internet governance. And what governance there is must be very tightly limited. Don’t get me wrong; I love the sound of that. It’s the next logical step in the progression of liberty: taking the case for freedom of association and expression to the global level. But that movement will obviously run into resistance at every juncture and require nation-states and various other entities to make certain sacrifices. It’s a fight worth having, however. A very crucial point that Mueller makes at various points throughout the book is that, from the perspective of Internet governance and individual rights, it is almost impossible to imagine an expansion of global Net governance for speech that does not also entail more significant economic regulation, or vice-versa. This has long been one of the core tenants of traditional liberalism / libertarian philosophy, of course, so it’s nice to see Mueller extend it to cyberspace here. There’s just no getting around the fact that our speech and economic rights are even more fundamentally intertwined and it’s even truer in the Information Age. This is a point that I have often stressed in my debates with Zittrain, Lessig, and Wu where I have argued that the whole “open vs. closed” debate is typically greatly overstated or misunderstood and that the best of all worlds is a dynamic, experimental one that allows for many different models or cultural and economic production to co-exist. I won’t belabor that point here since you can read those other essays for more detail. But this is a crucial point in the ongoing battle of ideas on this front if we are to unify the burgeoning movement. What Shall We Call This Philosophy / Movement? It’s interesting to me that Mueller goes back and forth between the terms “classical liberalism,” “cyber-libertarianism” and “denationalized liberalism” when describing his ideology. I suspect he’s struggling with the same issue many of us here do: Finding a word or term that carries less political baggage than “libertarianism” but that hasn’t been co-opted by others, as “liberalism” has. “Laissez-faire” would certainly be one label for this movement, but it’s too encumbered with capitalistic notions for some to embrace. “Classical liberalism” is the proper historic term, but one that has lost its original meaning, at least here in the United States. Today, “liberal” is synonymous not with a love of liberty but a love of government power. “Voluntary exchange” — of information, goods, money, or whatever else — is what Mueller is really getting at here. It doesn’t roll off the tongue nicely, but what separates this movement from others is volunteerism and a general openness to bottom-up, experimental, evolutionary dynamism over hierarchical, top-down, coerced visions of political organization. Amen, brother. Sign me up! Even if you aren’t compelled to join the cause, however, I highly recommend you pick up Mueller’s Network and States, anyway. It’s a terrific survey of the current state of Internet governance and an important work of political science since it offers us a useful spectrum of Net governance viewpoints. It belongs on the bookshelf of every serious student of cyberlaw and information technology policy.